Personalized Birthday Cards and Magnets to celebrate your baby’s big birthday milestone. 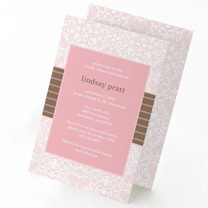 Modern Baby Shower Invitations personalized to match the baby and mommy-to-be. 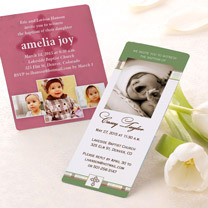 Beautiful designs for inviting loved ones to witness your little one’s special event. I chose this design for my son's baby announcements because the price fit my small budget. I was expecting to "get what I paid for", but was quite pleased with the image and color quality. We ordered baby announcements online and received our shipment before our expectations. The quality of these magnets were great. Everyone loved them and I am sure this picture will continue to be on our friends and families' fridge for a much longer time than a typical paper announcement. I wanted a cute baby announcement that wouldn't get thrown away, so the baby magnet was perfect. The template allowed me to add several pictures and whatever text I wanted. The finished product looked great. I will be sending them out this week and know I'll get complements. I love the baby announcement magnet that MagnetStreet produced. The pictures are very clear and I received the completed product in a timely manner. Not my first time using them and certainly won't be the last! From wiggles and giggles to wobbles and walks, each baby journeys through life in his or her own special way. Savor every special moment with Baby Stationery, personalized to match your baby’s unique personality and milestone. 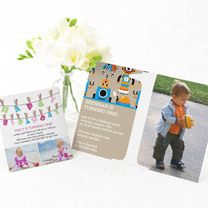 We offer modern Magnet and Card designs for Baby Showers, Birth and Adoption Announcements, First Birthday Invites, and more. Friends will smile, family will swoon, and everyone will cherish your stationery keepsake. Personalize any design template to match your baby’s special event and unique personality. From Flamingo pink to Kiwi green, pick your own colors from our diverse palette of over 70 hues. Have fun designing your own personalized Baby Stationery!